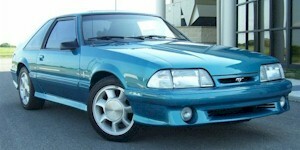 1993 saw the introduction of the Mustang Cobra built by Ford's Special Vehicle team (SVT). It only came in the hatchback body style. The SVT Cobra had a modified body panels, better handling, and 235 horsepower. The front grille is similar to the GT, but the top has an opening with a horse emblem and the lower has removed side scoops. The rear was a one piece design with exhaust cutouts and a special trunk lid spoiler. A special Cobra R model was built for racing in 1993.